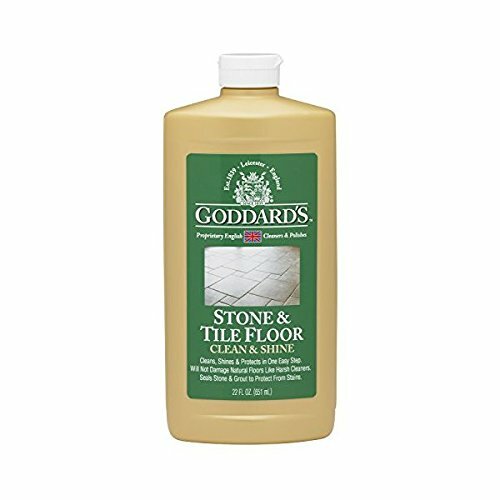 Goddard's Stone and Tile Floor Cleaner - Cleans, Shines, and Protects - 22 oz. For a high-quality cleaning agent that gently cleans the dirt and grime off your floors, use Goddard’s Stone and Tile Floor Cleaner! Goddard’s Stone and Tile Floor Cleaner smoothly remove the dust and soil that stick on the most heavily traveled areas of your floor, especially in the bedroom, bathroom, kitchen, dining room, and hallway. It not only cleans your floors, but also protects them from unwanted stains. This stone and tile floor cleaner brings back the natural beauty of any floor. It is safe to use on stone, tile, and even man-made flooring materials. The residue-free protectants leave behind a durable, clear shine that resists spills, scuffing, and dulling. Not only does this inexpensive product clean and protect your floors, it also shines them with its mild and effective formula. It is very easy to use: you just have to squirt it directly onto the desired surface and spread it out evenly using a damp, wrung-out mop. Goddard’s cleaners and polishes have been delivering a brilliant shine since 1839 and are the brand that is preferred by professionals for maintaining priceless treasures and antiques in renowned museums, galleries, hotels, and private estates throughout the world. This 2-in-1 cleaner and polish is proudly made in the U.S. and is kosher-certified. CLEANS, SHINES, AND PROTECTS - Goddard's Stone and Tile Floor Cleaner is a high-quality cleaning agent that gently cleans dirt, grime, and heel marks off the floor. It also seals stone and cement to protect them from unwanted stains. TWO-IN-ONE CLEANER - This floor cleaner is safe to use on stone, tile, and even man-made flooring materials. It has residue-free protectants that leave behind a durable, clear shine and help floors resist spills, scuffing, and dulling. MILD FORMULA - This 22-ounce stone and tile floor cleaner contains a mild and effective formula that will not damage natural floors like other harsh cleaners in the market. It has a gentle formula, safe to use for restoring the natural beauty of your floors. EASY TO USE - Remove any loose dirt by sweeping or vacuuming your floors first. Squirt this product directly onto the floor in an "S" pattern, covering approximately 3 square feet at a time. Avoid puddling, spreading it out evenly with a damp, wrung-out mop. Move to the next area and repeat. Rinse the mop as necessary to remove accumulated dirt. Your floor will dry to a beautiful shine in 10-15 minutes. Shake well before using. TRUSTED BRAND - Goddard's cleaners and polishes have been delivering a brilliant shine since 1839 and are preferred by professionals to maintain priceless treasures and antiques in renowned museums, galleries, hotels, and private estates throughout the world. This 2-in-1 cleaner and polish is proudly made in the U.S. and is kosher-certified. If you have any questions about this product by Goddard's, contact us by completing and submitting the form below. If you are looking for a specif part number, please include it with your message.